So you thought the ancient and modern wonders created by mankind and creative contemporary architecture were something? From underground ant colonies that extend farther than the Great Wall of China to termite mounds that tower at nearly twice the relative height of the Burj Dubai (tallest skyscraper in the world), and from the largest multi-species spider web ever discovered to the longest beaver dam on the planet, here are seven of the most awe-inspiring animal architects and architectonic structures of the animal kingdom. 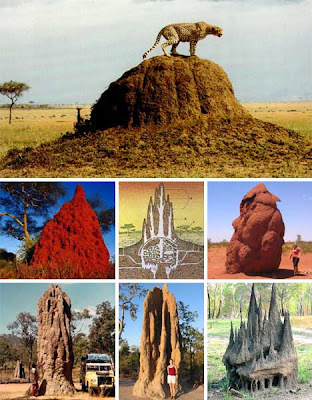 Termites are amazing creatures by almost any metric. Their queens are 30 times the size of normal soldiers and workers and produce about 30 eggs per minute to keep the colony alive. Relative to their size, termites build the biggest structures of the animal kingdom – .4 inch creatures constructing towers weighing hundreds of tons and up to 25 feet in height and 40 feet in diameter (the human equivalent of 4,600 feet tall). And that is just 40 feet above the ground - termites can also burrow as far as 225 feet underground. The so-called social (or sociable) weaver bird is one of the friendliest flyers in the sky. They combine forces and take over entire trees to make what can only be considered something like an awesome animal ‘apartment’ structure. 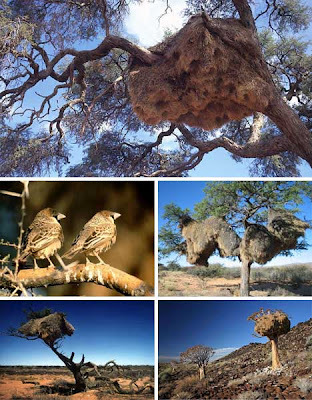 Instead of building independent nests, up to 300 pairs of birds come together to build giant mega-nests up to 25 feet wide, 5 feet high and with an individual room for every couple. As with a huge condo complex, there are multiple ‘basement’ entrances that lead up through clusters of chambers. 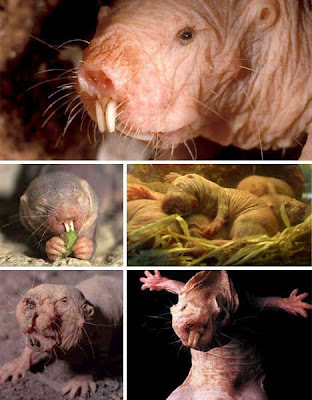 The naked mole rat goes by many names, including the potentially misleading “sand puppy” which might imply that these voracious diggers are cute and friendly fellows. They are uniquely eusocial amongst mammals, meaning they are hive-like and massively organized creatures like ants, bees, wasps and termites only much much larger and scarier looking. To add to their eeriness, they are essentially cold-blooded and feel absolutely no pain. Up to 100 of these strange creatures live together in a single underground habitat, which they dig with disproportionately gigantic sets of teeth that are placed in front of (rather than behind) their lips so they don’t swallow dirt. Naked mole rats can live for up to 28 years and colonies feed on tubers (engorged plant parts) that weigh up to 1000 times as much as an individual mole rat does. The largest ant colony discovered to date stretches over 4000 miles across Europe – this super-colony is suspected to have billions of ants. 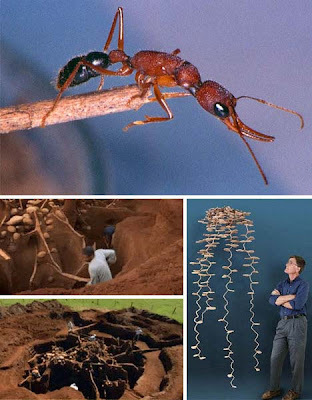 Everyone knows that ants are incredible builders that can carry many times their own weight but few have gotten to see inside their spectacular subterranean structures. The particular colony shown above is 500 square feet in size, penetrates 25 feet into the ground and required the displacement of 40 tons of dirt to be created. As it was dug up, transit tunnels and ventilation inflow and outflow shafts were revealed as well as fungus gardens and trash pits. Be sure to watch the scientists unearth this monstrous architectural undertaking in this amazing video. 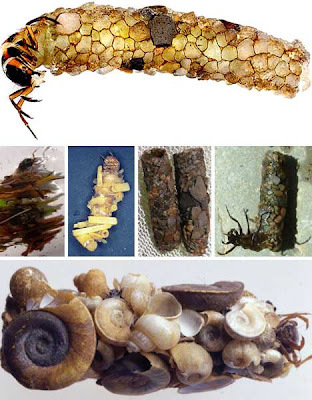 Unlike most of the intriguing animals and animal architecture in this list the caddisfly and its buildings are not massive communally-constructed mega-structures. On the contrary, the caddisfly makes relatively minute architecture but does so with remarkable versatility and (perhaps a stretch) artistic license. Using whatever materials are available – from sand and shells to twigs and trash – the larval form of these so-called “underwater architects” build themselves mobile “shells” to protect them and provide natural camouflage (made from local materials) as they develop. 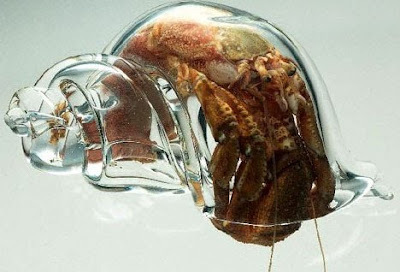 Eventually, they grow mandibles and swim to the surface where they discard their unique architectural creations, flex their wings and fly away. 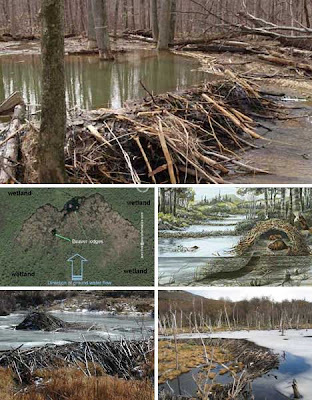 The longest recorded beaver dam in the world spans 2800 feet and has existed for over a decade. From the aerial images it is clear that at least two beaver families have worked in tandem in the construction of the record-setting structure. The nature of the wetland is such that long dams are needed to trap broad stretches of low-flowing water. Other dams in the area have been sized at up to 1500+ feet but at nearly 3000 feet this two-family dam is a one-of-a-kind discovery. 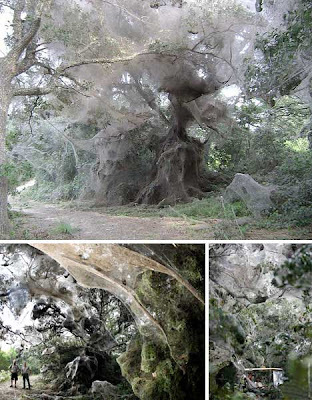 Thousands of spiders from twelve species worked together to construct this amazing web that spans over 600 feet. This is highly unusual behavior for spiders that normally fight over territory and prey, preferring to eat their enemies and build independent, solitary circular webs. However, record rainfalls provided such an abundance of edible insects that (scientists speculate) the spiders chose cooperation over conflict in this extraordinary case of evolutionary adaptation. Even more exceptional: the spiders did not just build it in the first place but have actually rebuilt the web three times after wind and rain has destroyed it.